The team’s study, “Decoding European Palaeolithic Art: Extremely Ancient knowledge of Precession of the Equinoxes“, recently appeared in the Athens Journal of History. The study team included Martin B. Sweatman (an associate professor at the University of Edinburgh’s School of Engineering) and Alistair Coombs – a researcher and PhD candidate with the Department of Religious Studies at the University of Kent. Together, Sweatman and Coombs studied the details of Paleolithic and Neolithic art featuring animal symbols at sites located in Turkey, Spain, France and Germany. What they found was that all of these sites used the same method of date-keeping, even though the artwork was created by people living tens of thousands of kilometers and years apart. According to the team’s analysis, the cave paintings were not simply depictions of wild animals (as previously thought) but instead represented star constellations in the night sky. These paintings were apparently used to represent dates and mark major astronomical events like comet strikes. In this sense, they demonstrate that ancient humans kept track of time by monitoring the precession of the equinoxes. This refers to the phenomena where the constellations appear to slowly shift in the sky in a cycle that spans a period of roughly 25,920 years. 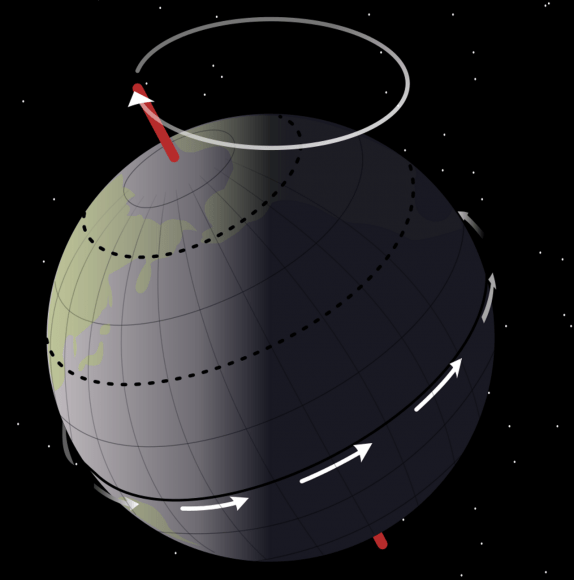 This is the result of axial precession: a slow, continuous change in the orientation of an astronomical body’s rotational axis. To an Earth-bound observer, the equinoxes appeared to move westward along the ecliptic relative to the background stars and in the opposite direction of the Sun. Their analysis including a clarification of earlier findings from stone carvings at Gobekli Tepe. Located in modern day Turkey, this site is dated to ca. 10,950 BCE, making it the oldest known temple site in the world. In a previous study conducted by Sweatman and Dimitrios Tsikritsis (a Doctor of Philosophy at the University of Edinburgh), they interpreted this site as a memorial to a devastating comet strike around 11,000 BCE. This strike is thought to have initiated a mini ice-age known as the Younger Dryas period, which began abruptly about 12,500 years ago and ended just as abruptly 1200 years later. By examining the pictograms and animal reliefs on the site’s many standing pillars (using the planetarium program Stellarium 0.15), they concluded that the images bore a resemblance to constellations that would have been visible in 10,950 BCE. For this study, the team compared artwork in various locations with the positions of stars in ancient times, which they simulated using Stellarium 0.18. From this, they were able to decode what is perhaps the the best known example of ancient artwork – the Lascaux Shaft Scene, which is part of a series of cave paintings located in the Lascaux caves in southwestern France. These paintings, which feature a dying man and several animals, may be an astronomical record of another comet strike that took place around 15,200 BCE. In addition, they found that the world’s oldest sculpture, the Lion-Man of Hohlenstein-Stadel cave (which is located in southern Germany) appeared to conform to this ancient time-keeping system. This sculpture is dated to 38,000 BCE, making it the earliest piece of evidence of prehistoric astronomy. Another site they considered was Catalhöyük, an ancient settlement in modern-day Turkey that existed from approximately 7500 BCE to 5700 BCE. Within the excavated shrine rooms, their are carvings of animals (auroch heads, ram heads, a bear symbol and the pouncing lion/leopard) that are similar to reliefs found at Gobekli Tepe and are believed to represent the constellations of Capricornus, Aries, Ursa and Cancer. What this reveals is that as early as 40,000 years ago, humans may have been keeping track of time based on how the position of the stars slowly changed over the course of thousands of years. The commonalities found between sites would also seem to indicate that these traditions survived the passage of time and were carried from place to place by prehistoric humans as they migrated. In essence, ancient people may have had a far greater understanding of astronomy than previously thought. This could have drastic implications when it comes to our understanding of prehistoric human migration, since this knowledge could have aided navigation of the open seas. It could also help anthropologists further refine their theories of when migrations occurred. This, along with many findings over the past century across multiple disciplines, appears to be telling us that our ancient ancestors were far more knowledgeable than we gave them credit for. And by learning more about them, we might even be able to learn something about ourselves. – Archeoastronomy is an eager pattern searching pseudoscience. – A paper published in a historical journal has nothing to do with science. – But it is likely not even that, Athens Journal of History – published by ATINER – is listed as a predatory journal by Beall. – Sweatman is a chemical engineer. “A paper published in a historical journal has nothing to do with science. ” Whaou, what an argument! IIt’s a pity because all your other arguments are relevant. We can add it that they place the Chauvet cave in Spain and not in France. This kind of publication has more its place in the section essay rather research. Are you trying to say the Chauvet cave is in Spain, because it absolutely is in France. With a such serious of the lecture commitee from the Athens Journal of History, I understand why they’re listed as a predatory journal by Beall. Oh, I see what you’re saying. Yes, that is a pretty glaring error. Thanks for pointing that out.